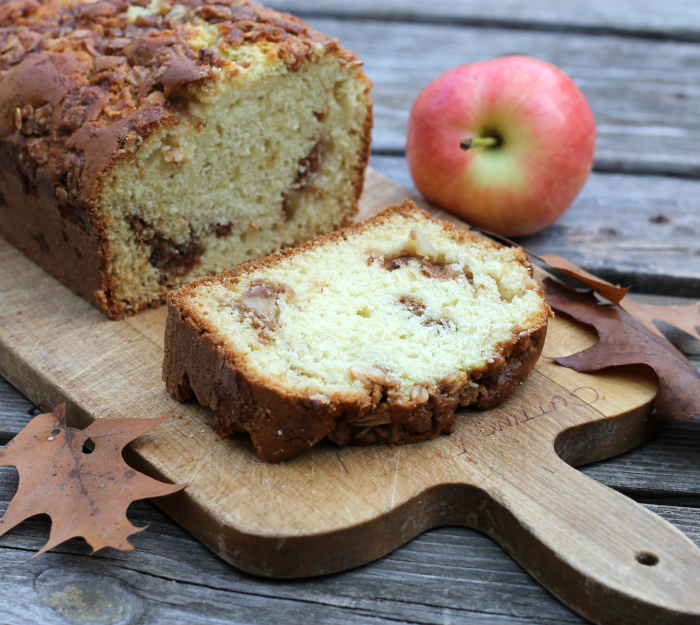 A moist quick bread with a swirl of apples that run through the bread, perfect, since apples are in season. Can you believe that it is Halloween week? I feel like I should be posting a cute recipe featuring a Halloween treat. Well, maybe it is too late to do that, you know that when you are a blogger you have to be ahead of the game. How many of you are thinking of your Thanksgiving recipes? Sad to say, I forget about posting recipes for the holidays or least most of the time. I know that I have posted candy and cookies around Christmas, but not too much otherwise. Maybe that is something I should change. We will see. 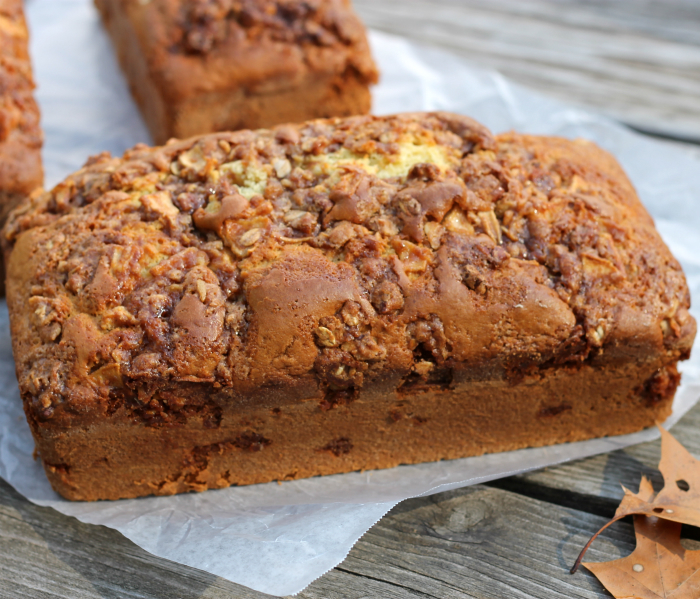 Well at least I have a delightful quick bread that features some apples, along with cinnamon, brown sugar, and pecans. I am sure that I am in the right season… apple season. Did you hear that there was a great crop of apples this year? I wanted to make apple bread, but instead of adding them to the batter, I decided to add them to the streusel. 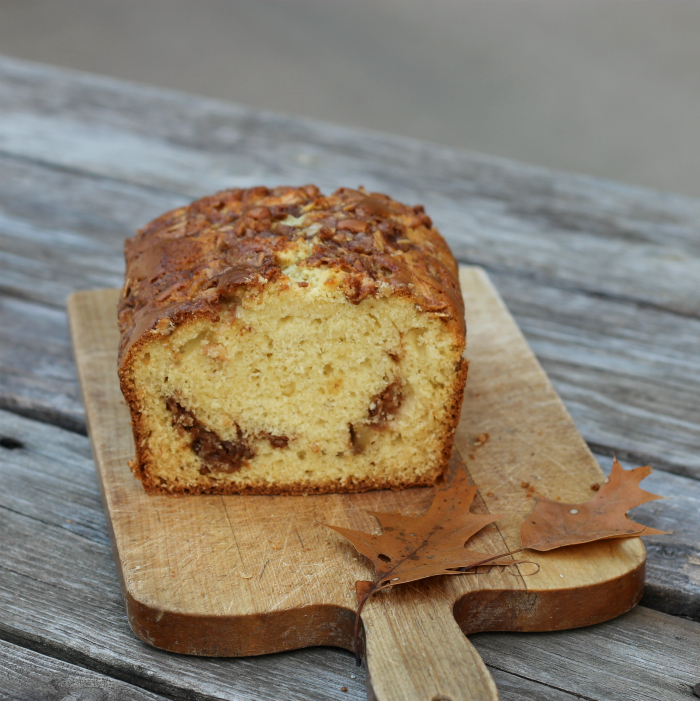 The streusel is divided into two parts, the first part is sprinkle in the middle of the loaf and the rest is used for the top. The apple flavor still comes through into the bread and I like the little bits of streusel that is in the center of the bread. Plus, this time of year the weather is getting cooler and I just love the smell of apples and cinnamon baking in the oven. 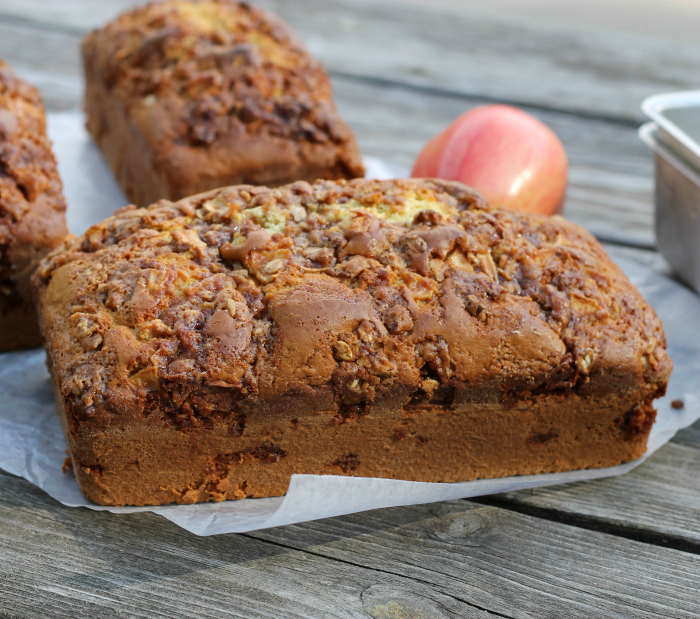 If you love the smell of apples and cinnamon baking in the oven at this time of year, I hope you will try this recipe. Preheat oven to 350 degree F. Grease and flour a 9 by 5-inch bread pan. In a medium bowl mix the pecans, flour, brown sugar, and oats mix together. Add the butter and toss until well blended. Add in the apples and toss until mixed well. In a large bowl sift together the flour, sugar, baking powder, baking soda, and salt. In another bowl mix together the yogurt, eggs, butter, and butter. Pour the mixture into the dry ingredients. With a electric mixer mix until well blended. Pour half of the mixture into the prepared bread pan. Sprinkle half of the streusel over top of the batter. Careful spread the rest of the batter over the streusel. Sprinkle the rest of the streusel over the top of the bread. Place the bread in the oven for 45 to 50 minutes or until a toothpick inserted comes out clean. Remove from oven and set on cooling rack. After 5 minutes remove the bread from the pan and continue to cool on the cooling rack. Hi Dawn, another fabulous bread, you are on a baking roll. Love the streusel. This is a must try! It sounds delicious and I can imagine how good it tastes. I’m new here and will be looking around! 🙂 Thanks for the recipe!